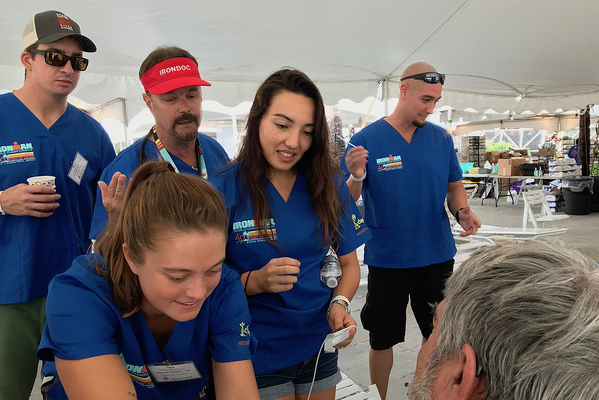 Pictured: Our MD students helping an athlete inside the first aid tent in Kailua-Kona. 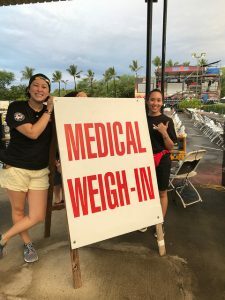 Kailua-Kona event shows students the community of physicians they will become part of, and the lifelong commitment to volunteer service they’re signing on for. 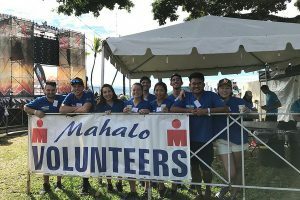 (Kailua-Kona, Hawaiʻi) They didn’t compete in the race themselves, but eleven University of Hawaiʻi medical students played a big part in pulling off the 40th annual Ironman World Championship on October 13 in Kailua-Kona. 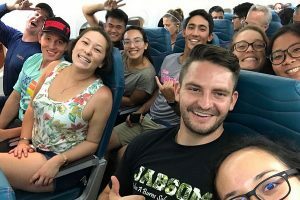 The students, from the John A. Burns School of Medicine (JABSOM), flew to Hawaiʻi Island last weekend to report for duty, staffing the first aid tents at the race. Fourth year-student Keahi Horowitz is the veteran. He has volunteered four years in a row now, this time showing the ropes to second-year MD students Lucia Amore and Jenna Yoshisato, co-coordinators of the JABSOM trip and the eight first-year MD students all enthusiastic about the opportunity to pitch in at what has become a legendary sporting event. “It was non-stop from when we began our afternoon shift at the medical tent from October 13 at 3 p.m. until the next morning at 1 a.m., when we signed off,” said Amore. The Ironman is a 140.6 mile race by foot, bicycle and ocean swim. The Weigh In station is an important medical resource. One of the first stops for race participants is the “weigh-in tent.” There is a medical reason for that. It is how the medical workers assess the dehydration an athlete has suffered (in weight lost). The JABSOM students helped with the pre-race measurement of all athletes then treated those who needed help with oral rehydration therapy first, which consisted of water, Gatorade or hot broth. “If the dehydration did not get better significantly, the IV team started normal saline,” said Amore. Lounge chairs from the Courtyard by Marriott King Kamehameha Kona Beach Hotel served as treatment beds, with the students decked out in professional looking Ironman Medical scrubs. Eighteen MDs were on hand to supervise the MD students and other health professional volunteers, including orthopedic surgeons, sports medicine doctors, internal medicine, emergency medicine and family medicine doctors, anesthesiologists, nurses and technicians. Our JABSOM students enjoyed meeting and learning from each of those they encountered. Dr. Ted Leon, who has volunteered for Ironman for nearly 20 years and completed the Ironman World Championship at Kona previously, met with the JABSOM volunteers one week prior to departure to discuss common things we would see. The second-year MD students were impressed with the cutting-edge Zoll 12-lead EKG and iSTAT equipment used in transmitting heart monitoring data. “Maybe Dean Hedges can join us next year with his background in Emergency Medicine,” quipped Amore. Our students paid some of the costs to fly to Kailua-Kona but also received financial assistance from donors to the medical school. There was no lack of work to do. Some athletes had cramps and needed massage or to be fed potassium-rich bananas or salty potato chips or treatment with magnesium or electrolytes. Racers’ toenails fell off, skin was chafed, the pain of shin splints needed the soothing numbness provided by ice packs. Many a finisher was closely monitored for “wooziness” as he or she approached the final stretch, with the future physicians on hand to keep them from falling. Amore found inspiration in the stories of a man from Brazil who qualified for the Ironman decades ago, yet never managed to get here until this year. There were some 80 year-old finishers who have completed Ironman for several years and finish strong, Amore said. That feeling: Dog tired. Totally appreciated. 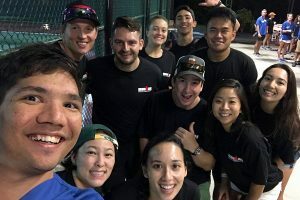 Our MD student volunteers included Keahi Horowitz, Lucia Amore, Jenna Yoshisato, Anthony Kwon, Anthony Lim, Sylvia Koo, Sara McAllaster, Weston McCue, Paul Baker, Maiya Smith and Tyler Thorne. “When I asked them about their motivation, they told me that the will to finish is what determines your dreams. While the Ironman is a physical challenge, the test of will it provides is something that is universally understandable to everyone. Everyone has something that is a test of their will, their will to finish, their will to achieve something, after which things are forever different,” said Amore.